Howl and Other Poems 0 Edition The epigraph for Howl is from Walt Whitman: "Unscrew the locks from the doors!/Unscrew the doors themselves from their jambs!" 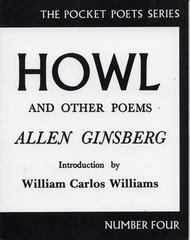 Announcing his intentions with this ringing motto, Allen Ginsberg published a volume of poetry which broke so many social taboos that copies were impounded as obscene, and the publisher, poet Lawrence Ferlinghetti, was arrested. The court case that followed found for Ginsberg and his publisher, and the publicity made both the poet and the book famous. Ginsberg went on from this beginning to become a cultural icon of sixties radicalism. This works seminal place in the culture is indicated in Czeslaw Milosz's poetic tribute to Ginsberg: "Your blasphemous howl still resounds in a neon desert where the human tribe wanders, sentenced to unreality".